August 1, 2018. Leh, Ladakh, J&K, India – The road from Choglamsar on the Leh-Manali highway up to the Tibetan Children’s Village School is walled on both sides and climbs like a winding alley. This morning, as His Holiness the Dalai Lama arrived, Tibetans young and old, including bands of drummers and flute players, lined both sides of the road to welcome him. Walking from his car to the covered stage above the school ground, His Holiness paused now and then to bless groups of the elderly, infirm and handicapped, who were waiting to see him. School officials and former Rajya Sabha Member, Thiksey Rinpoche welcomed him to the stage. The entire gathering stood as a student band performed the Tibetan and Indian National Anthems. Director Chemey Lhundup gave a brief report of recent developments at the school, focussing particularly on the establishment of a unit to care for children with special needs. This has involved making arrangements for specifically dedicated staff and facilities and has been supported by the Dalai Lama Trust. Students presented a traditional Tibetan dance. In his extensive report about the Sonamling Tibetan Settlement, Chief Representative Tseten Wangchuk paid tribute to the late Sonam Dawa, councillor for Thiksey village, who died earlier this year. He mentioned that a Geshe has been teaching a popular introduction to Buddhism to widespread benefit. Other developments included medical camps offering advice on how to prevent illness, as well as providing treatment for those in need. The Men-tsee-khang also travels to different parts of Ladakh offering diagnosis and treatment. Nomads living in Chang Tang come under the Settlement’s care as well as residents in Leh. The report also touched on cleanliness drives in line with the Government of India’s Swachh Bharat campaign, requests for support to the J&K State Government and the drilling of bore-wells to address the scarcity of water supported by Save the Children Fund. Celebrations of the 100th anniversary of Bakula Rinpoche’s birth were held and in July settlement representatives visited the Tibetan Muslim community in Srinagar. The Chief Representative concluded with prayers for His Holiness’s long life and the fulfilment of his wishes. Following a traditional dance by members of the Sonamling Settlement, TCV requested His Holiness to present gifts on their behalf to Ladakhi leaders among the guests. “Homage to Avalokiteshvara,” was how His Holiness opened his address. “Today, I’ve come to this settlement, where a large number of schoolchildren are present, and I’m going to speak to you as a Tibetan from the Land of Snows—in Tibetan. The majority of Tibetans in Tibet and in exile place their trust in me, so I’d like to say a few words to them. “Tibet is often called the Roof of the World. A Chinese archaeologist told me that ancient remains he had seen suggest that human settlement in Tibet is 35,000 years old, which is quite early by any standards. At one time the country may have been known as Shang-Shung. Then in the 7th century King Songtsen Gampo married a Chinese and a Nepalese princess and through them made a connection with Buddhism. He instigated the creation of written Tibetan, involving an alphabetical script based on the Indian Devanagari and grammar. “In the 8th century, when King Trisong Detsen wanted to establish Buddhism in Tibet, he invited Shantarakshita. This great scholar from Nalanda introduced a monastic mode of learning. He set up the first monastery at Samye, which included a section for celibate monks, and ordained the first seven Tibetans to see if they could keep the vows. “Under his direction work began on translating largely Sanskrit Buddhist literature into Tibetan, with the result that today we have the 100 volume collection of the Kangyur—the translated words of the Buddha, and the 225 volumes of the Tengyur—the treatises of subsequent Indian masters. He introduced the approach we still follow today of memorizing the root text, studying commentaries to it and exercising what we’ve learned in debate. This takes the form of refuting others’ points of view, asserting our own and rebutting criticism. “Shantarakshita was a consummate scholar, a great philosopher and logician, as his writings attest. Thanks to his guidance, the Tibetan language was deeply enriched during the process of translation. Subsequently, through their study and practice Tibetans have ensured the preservation of Buddhism. The commentaries Tibetan masters have written are estimated to number more than 40,000. “Our Tibetan ancestors fulfilled the wishes of the great trio, Adept Padmasambhava, Abbot Shantarakshita and King Trisong Detsen and spread Buddhism across Tibet. And we who have come after them have kept the tradition alive. “To prove the truth of the Buddha’s teaching, relying solely on scriptural citation is unsound because of inconsistencies in these various presentations. Later logicians categorised the scriptures into those that can be relied on as definitive and those that are provisional. Logic and reason were the key and the students who were debating here at the start are taking part in that tradition. His Holiness observed that it is largely the training in logic and reasoned argument that has equipped Tibetan scholars to interact with modern scientists. They have learned more about the material world and the scientists have learned about the mind—in other words the conversation has been of mutual benefit. Study of science has since become a set part of the great monasteries curriculum. This innovation means the monasteries now more closely emulate the situation in Nalanda depicted in Bhavaviveka’s ‘Blaze of Reasoning’ that describes a broad range of contrasting views vying for attention. “We have faced a lot of difficulties,” His Holiness continued, “yet the Tibetan spirit remains strong. We are not opposed to the Chinese people as such, but narrow-minded, hard-line members of the Chinese Communist Party have given us a hard time. As long as Tibetans seek to preserve their unique characteristics these hard-liners misinterpret it as a wish to separate from China. In the course of our struggle thousands of monasteries and temples were destroyed. Monks were subject to brutal treatment too. And all my virtue and happiness may be given to them. “Similarly, another monk I knew was caught up in the Chinese prison system for 18 years before he was able to come to India. When I talked to him about his experiences, he told me that he had faced danger many times. Thinking he meant a danger to his life, I asked him to tell me about it. He replied that he had several times been in danger of losing compassion for his Chinese persecutors. “Historical documents tell us that in 7th, 8th and 9th centuries three empires flourished—China, Mongolia and Tibet. There is no mention in those Chinese documents of Tibet being part of China. His Holiness remarked that Tibetans in Ladakh have done what they can to keep their knowledge and culture alive. 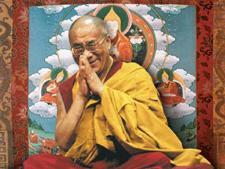 Elsewhere in the world, he said, Tibetans are valued for their manners and integrity. He touched on his retirement in 2011 and his devolving of political responsibility to an elected leadership. He mentioned that where some travellers used to refer to Tibetan Buddhism as Lamaism, there is now a universal recognition that it in fact represents the Indian Nalanda Tradition. His Holiness concluded with a story of Mao Zedong asking him in 1954 if Tibet had a flag. On hearing they did, he told His Holiness it was important to preserve it and fly it alongside the Red Flag. Therefore, when Chinese embassy staff complain about the flying of Tibetan flags in different places, he encourages supporters to say that Mao Zedong personally gave the Dalai Lama permission to fly it. In uttering the words of thanks, Dhondup Tsering told His Holiness that his kindness cannot be repaid, but, on behalf of Tibetans in the settlements and in the nomad areas, he prayed that His Holiness live long and that his wishes be fulfilled.